Playgrounds can be innovative, bold environments with intriguing sculptural forms: their colors bright and exciting; their designs active - imprinted with the rhythms of jumping, climbing, running, and hanging. They can capture our imagination as fully as abstract works of fine art. 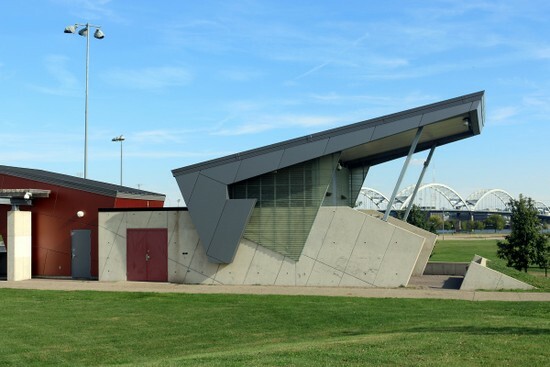 The fountain and playground area in Schwiebert Riverfront Park and the Davenport Skatepark in its entirety are among the most compelling and visually exciting environments created for play in the Quad Cities. There are other wonderful places in the Quad Cities for children to play, learn, and socialize, such as the Family Museum in Bettendorf and the Fejervary Learning Center in Davenport. (Happily, the Mother Goose entrance to the latter is restored.) But they are inside or fenced in - not necessarily "in plain sight." 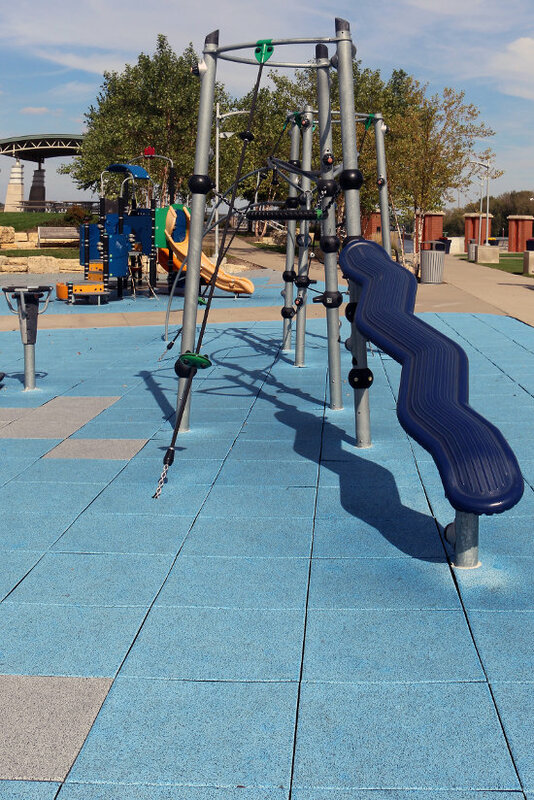 The groups of playground equipment at Schwiebert Riverfront Park, on the Mississippi riverfront between 17th and 20th streets in downtown Rock Island, are like islands on a sea of blue padded tiles - crazy geometric shapes with Dr. Seuss-like chutes and ladders on metal stilts. Each has multiple entries and unique nooks and crannies waiting to be explored. Integrated into the playground are digital electronic games without instructions. Near this playground is a fountain area also designed for play. Children run through or from water sprays that bubble up from the ground, starting and stopping unexpectedly. Or through a row of water arcs lining one side of the fountain. The most striking visual element of this area, though, is the beautiful elliptical shapes in the fountain's floor that cover an area nearly 100 feet in length. To me, they suggest planetary orbits; to someone else, they might suggest something very different in this imaginative environment. The creative qualities and open-ended play encouraged by the fountain area are characteristic of a "playscape," an area that breaks away from specific play equipment. Playscapes were inspired in large part by sculptor and landscape visionary Isamu Noguchi (1904-1988), who began working on playscapes in 1933. The SAA Design Group of Madison, Wisconsin - now part of Ayres Associates - was the prime consultant for this beautiful park, including the playground and fountain. The striking geometric patterning in Schwiebert park's fountain and playground is matched by the Davenport Skatepark at 700 West River Drive. SkateboardPark.com described the 33,000-square-foot park as "a good-sized beast with super-smooth transitions." The Web site proceeded to list a handful of skating features including "shallow bowls," "a small spine," "street obstacles," and "hubbas." To a non-skateboarder such as me, it is better described as a breathtaking environment of concrete rivers flowing through concrete canyons. The ramps and arcs are graceful - like an ocean's wave that a surfer could ride, but the bright stripes and checkerboard patterns are the visual language of a speedway. Both give the park a sense of excitement. The project manager for the Skatepark was Brad Siedlecki, owner of Pillar Design Studios (based in Arizona and Chicago). His co-designer, Colby Carter, is lead designer for California Skateparks. A professional skateboarder for 10 years, Carter has designed and developed more than 250 skateparks and events worldwide. The park's most distinguishing feature is the shelter, concession-stand, and restroom structure designed by Rock Island architect Perry Gere. Its dynamic geometric concrete forms are angled to spectacular effect - reflecting the visual daring of the park as a whole. Architecturally, the building suggests a mid-century modern style (Googie more specifically), yet it feels contemporary. American playgrounds date from the late 19th Century, when suffragettes and other social reformers attempted to improve the conditions of the poor living in slums created by the industrial revolution. They can also be traced to German psychologists and educators such as Friedrich Fröbel (who originated kindergarten in Germany in 1837); they saw playgrounds as fundamental for child development and essential in the educative process. The Playground Association of American was founded in 1906, electing Theodore Roosevelt as honorary president. With his support, the number of municipalities with playgrounds in America grew from 90 in 1907 to more than 500 in 1910. 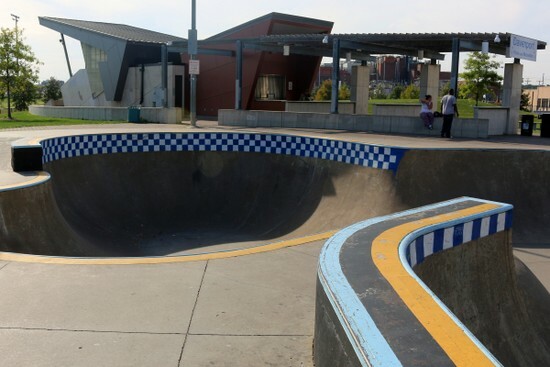 The Davenport Skatepark opened in 2006, and Schwiebert Riverfront Park followed in 2010, and they represent the continuing evolution of playgrounds and parks. New technologies and materials, as well as evolving concepts about the purpose of playgrounds, ensure that exciting changes are still ahead. A new trend is to create multi-generational playgrounds. For example, the Humana Foundation and KaBOOM have partnered to build more than 50 such playgrounds in cities across America in the past few years; the closest to us are in Cedar Rapids, Des Moines, and Chicago. Mike Vietti, a KaBOOM spokesperson, put it this way in numerous articles: "Instead of adults just sitting on benches while their kids play, they can also be active and keep an eye on the kids." As Paige Johnson wrote at Play-Scapes.com: "This is an incredibly interesting time for playground design. The surge of interest in public spaces and design for children, urban interventions, and a maker culture are intersecting with the availability of new materials and advanced technology to create an explosion of interesting play ideas and themes."